The programme for the 2018 Annual Conference of the Northern Ireland Heritage Gardens Trust (NIHGT) has now been published. The event will be held in Armagh from 4-6 October. Please see attached. We’re delighted that once again the conference has an excellent line up of speakers from Ireland and Britain who will be able deliver a wide range of interesting presentations of the conference theme of ‘Heritage Landscapes in the Urban Realm’. I’m also particular pleased that there will be a significant focus on trees and woodlands. The attached photo could be of interest to visitors to the ITS website. 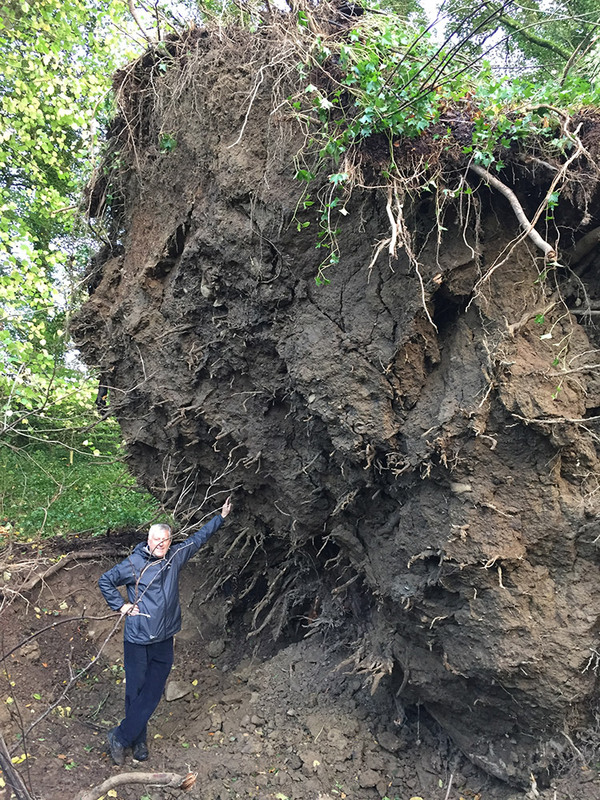 It is the root plate of one of the lime trees planted at the time Russborough was built, mid 18th C. which stood on the entrance drive until toppled by Hurricane Ophelia in October. The scale is most impressive, (and has not been photoshopped!). About 110 members of the Royal Scottish Arboricultural Society, established in 1854 (since 1930 the Royal Scottish Forestry Society), visited several notable collections of trees in Ireland during the latter part of August 1897. Initially, they spent four days within 100km of Dublin, then four days in the Killarney area and in West Cork. The report is notable chiefly for its careful account of the sizes of trees, commonly listing height, girth and crown spread, with some estimates (or, for younger trees, more certain records) of tree age: in the Phoenix Park, and in the collections at Powerscourt, Charleville, Killruddery, Coolattin, Trinity College Botanic Gardens, Hamwood, and Carton. These records may be the earliest printed records of the sizes of trees in these places, and are of historical interest: several trees undoubtedly survive today, and may probably be revisited from the careful descriptions of their locations. Indeed, the extensive accounts (62 pages on the Dublin region) are remarkably informative, not least for their social commentaries. 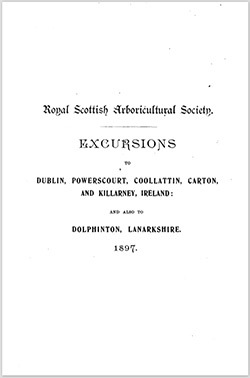 One may admire, if not perhaps emulate, the activity of the participants: staying at the Gresham Hotel, they visited both Trinity Botanic Gardens and the RDS in Ballsbridge (starting at 06.00) before leaving the city (on “a dozen of well-horsed and commodious brakes”) for Carton and Hamwood at 09.00! Another day, they departed Dublin at 08.00 by train for Bray, thence to see three great gardens of Wicklow. 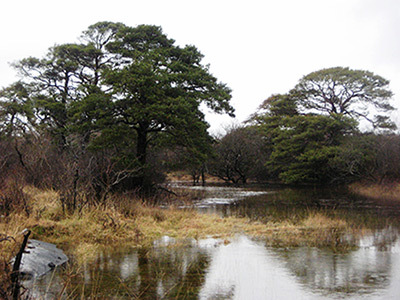 A special train to Shillelagh was provided for their visit to Coolattin, a place – some 100 years later – of inspiration to the nascent Irish Tree Society, as Thomas Pakenham has recorded in The Company of Trees. This is, unquestionably, a vivid account of a well-informed excursion to see specimen trees, with commentaries on the scenery of estates and countryside. The vagaries of taxonomic nomenclature may be initially confusing: for example, Abies Douglasii = Pseudostuga menziesii, Abies pectinata = A. alba, Araucaria imbricata = A. araucana, Pinus insignis = P. radiata, and others; but the current names are easily detectable by a quick Google search. 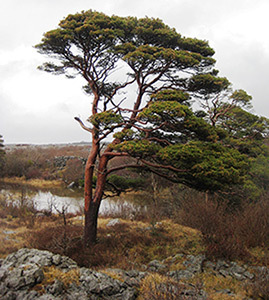 Botanists from Trinity College Dublin have re-written Ireland’s natural history books by discovering that Scots pine trees are in fact native to the country, and that they have been thriving in County Clare for thousands of years. An insect that has killed more than 99% of North American ash trees it has infested could be heading to the UK, according to scientists. The emerald ash borer is a beetle that is native to Asia and eastern Russia, but entered into North America around 2002. It has now been found west of Moscow and scientists believe it is heading towards Europe. They made their comments on the BBC Radio 4 documentary Ashes to Ashes. Common ash, which is widely found growing in the UK, has been found to be susceptible to the insect. Emerald ash borer (Agrilus planipennis) is a small green-coloured beetle that co-evolved with Manchurian ash and other native ash in Asia. 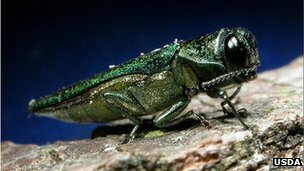 In its native environment, the emerald ash borer does not harm the ash trees it infests. It is also found in far fewer numbers. But in North America, it has devastated ash wherever it has spread. Prof Steve Woodward, a tree pathologist from the University of Aberdeen, says he is alarmed at the effect it is having. "The problem is: once it's spread out of Asia, out of maybe China, then ash species it's encountering along the way show no resistance to it. "It's now in the eastern part of the USA, where it's killed literally tens of millions of ash trees over the last 10 to 12 years." Much effort and money is being now put into trying to find out more about ash dieback, which is caused by the fungus Chalara fraxinea. 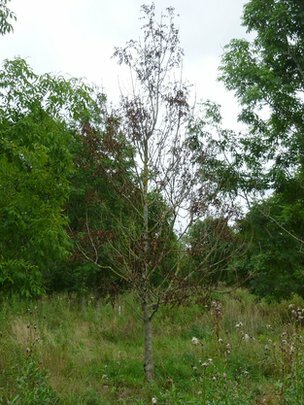 Research into finding trees that appear to be tolerant to the ash dieback fungus is ongoing across Europe. But Prof Woodward believes we also need to be looking at the potential threat from the emerald ash borer. "Some of these ash trees may show some tolerance or resistance to being infected by Chalara. The problem with then jumping on that as though it's a great solution to the problem of ash and the loss of ash is that those trees may be susceptible to other things. "Now, it's highly, highly likely that they will still remain highly susceptible to the emerald ash borer, which although is not in western Europe yet is in the geographical area of Europe. It's about 250km to the west of Moscow and is spreading westwards." The Forestry Commission is aware of the potential threat. It told the BBC: "Emerald ash borer is unlikely to reach the UK for many years. Strict rules are in place to minimise the risk of it being introduced to the UK, and we are currently looking at ways to further reduce the threat." Prof Enrico Bonello, from Ohio State University in Columbus, Ohio, has been studying resistance of ash to the emerald ash borer. He says it was first detected in the Detroit area in 2002. Currently, scientists think it was imported on wood packaging from Asia. Prof Bonello was invited to speak at the European Cooperation in Science and Technology (COST) FRAXBACK meeting in Malmo, Sweden. He told the delegates that common ash, found across Europe, is susceptible to the devastating effects of emerald ash borer. The insect infests the tree by laying eggs on the bark. The developing larvae then burrow inside the tree, eating the tissue that allows water and nutrients to be transported. "When you have mass attacks on the tree, you have thousands of larvae acting at once. Essentially, you're starving the root system and the tree dies." The trees die within two or three years of being infested. Dr Eric Allen, from Natural Resources Canada, the Canadian Forest Service, believes that the future for ash in North America and Europe is very bleak. He thinks that ash will go the same way as chestnut 100 years ago in eastern North America, which was decimated by chestnut blight. A few young trees do survive, but they die before they mature. He says: "I think it's fair to say that the ash population in both Europe and North America are seriously threatened." Scientists suspect that our ash trees are susceptible to Chalara fraxineaand emerald ash borer because both are imported. So, the North American ash trees and our European ash have not co-evolved with these threats, and so have not had the chance to evolve any defences. Both emerald ash borer and Chalara fraxinea happily co-exist with Manchurian ash in Japan and throughout Asia. Dr Richard Buggs, from Queen Mary University of London, thinks the key to protecting our ash and what is left of the ash in North America could lie with the seemingly healthy Manchurian ash trees in Asia. "In the future, we probably need ash trees that are resistant to both ash dieback and the emerald ash borer. "And Manchurian ash, as it does seem to have co-evolved with both of these, is a really good candidate for a tree that could give us clues as to how we could have resistance to both of these pests." Ashes to Ashes is presented by Prof Adam Hart and produced by Ania Lichtarowicz. It is broadcast on BBC Radio 4 at 1100 BST on Friday 27 September. It will then be available to listen again on the iPlayer. Crann and Coillte requests the pleasure of your company at a family day celebration of the ‘Coming of Age’ of Oak Glen, (nominal end of planting 1992) their joint project to re-establish an oak forest park in Glencree. Venue: The Oak Glen site, Cloon Wood, Glencree, Co. Wicklow. Time: 12noon until 4p.m. Official tree planting ceremony at 3p.m. Bring your own picnic “leave no trace” and enjoy a day in the woods. Dress for the weather and wear suitable footwear. All are welcome and especially those who sponsored grid referenced trees. Crann Chairman, Tony Carey, stated that the Oak Glen event is a celebration of a unique joint project between Coillte [the State Forestry company] and Crann [an Irish charity that promotes trees for environmental enhancement] to recreate an oak forest park in the area of Glencree where there has previously been a Royal forest park in the 13th century. This is remarkable evidence and a milestone of an environmental restoration project of particular significance which was launched in 1990 by Taoiseach Charles Haughey. The first tree was planted in 1990 by President Mary Robinson and the final tree in phase one was planted by Bob Geldof. Coillte undertook to manage the plantation, with sponsors and the general public having access rights under Coillte’s Open Forest policy. Initial establishment costs were largely funded through sponsorship by many thousands of people of about 120,000 oak trees. These sponsors ‘invested’ through grid referenced certificates in groups of five young trees of which one, on average, would develop to maturity after thinning. It is planned to have the grid referencing transferred to a GPS based grid that can be accessed through the Crann website – www.crann.ie – or directly through a smart phone link. Oak Glen is sited in the townsland of Cloon in Glencree valley which is about 6.5 km west of Enniskerry on a 3rd class road to Glencree. Entering into Enniskerry village from the R117 (the twisty road from the N11) go to the right of the clock tower, and go straight on uphill and straight over a crossroads signposted for Glencree that has a fruit & veg shop on the left. Continue for about 6km until you reach the Cloon-Oak Glen car park. Note: If you find yourself at the entrance to Powerscourt, you are on the wrong road and must go back to the village centre to find the road to Glencree!